Beer? Check. Chicken wings? Check. 3-D glasses? Check. Is everyone ready for Super Bowl Sunday? "We worked longer on this than anyone in the history of the Super Bowl  4½ years!" says DreamWorks' Jeffrey Katzenberg. (The 4½ years, by the way, is how long it took to make the whole movie, from which the trailer was taken.) "The last time someone has actually run more than a 60-second spot at the Super Bowl was when Nike did it in the mid-1990s. We wanted 90 seconds so we could take the time and try and tell a bit of a story." A lot is riding on the success of Monsters, which is why DreamWorks is ponying up for the marketing blitz. Nearly five years ago, Katzenberg decided to put his money where his vision was and, starting with Monsters, committed to making all his company's animation in 3-D from the outset. 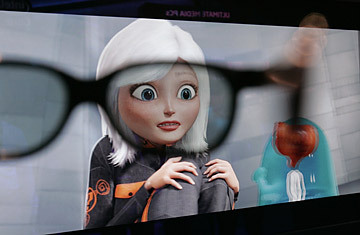 While Disney's Pixar and others have also produced 3-D animation over the years, the special effect is typically added during postproduction. DreamWorks built its own 3-D-authoring software and hardware and, along with Intel and Hewlett-Packard, built a server farm that fills a room, floor to ceiling, the size of a small banquet hall. Among other tools, moviemakers there jury-rigged a video camera that allows the director to peer through it while moving and navigate through a virtual scene in real time. That helps him block scenes and understand how to use the Z-axis that adds the third dimension to film. When Monsters is released in late March, it will be shown in nearly 1,500 movie theaters that have been equipped with a device that fits over a digital movie projector, converting its image to 3-D. Moviegoers will get disposable Polaroid glasses that look like sunglasses, making the 3-D effect far more engaging than it was with the old-fashioned red-cyan anaglyph cardboard glasses of the 1950s and '60s. That said, the Super Bowl commercial (as well as Monday night's episode of the NBC sitcom Chuck) is designed for TV broadcast and requires a setup that's similar to anaglyph  a newer, higher-quality version called ColorCode. "It doesn't bleed colors out the way the old anaglyph glasses did," says Katzenberg. "But consider this a warm-up for the movie-theater experience, which, honestly, is 100 times higher quality than you could see on TV. This is like a Razor scooter compared to the Ferrari experience of seeing it in a theater." Katzenberg said Super Bowl viewers could still enjoy the commercials without the glasses: "If you don't wear 3-D glasses and you have three beers, it'll look like everything else you're looking at." See pictures of Super Bowl entertainment through the ages. See pictures of the long, sad history of Cardinals football.